In her freshman year, because Kylie got injured, her Mom took her to all of her brothers’ cross country track meets. It was during this time that she recognized running as a sport because of all the cheerfulness and support shown be the team members for one another. It changed her outlook on running and inspired her to go out for Track & Field herself. As a member of the distance Track & Field team at school, Kylie’s coach says she is one of the hardest working student athletes he has ever coached. She is projected to be their best cross country runner coming into her senior year. With the assistance of this scholarship, Kylie can attend The American Running Camp this summer and enhance that possibility. Walter would be so proud if he knew how much he was able to help Kylie further her running dreams. Mary was first introduced to the excitement of running at the age of eleven when she ran the Falmouth Road Race. She fell in love with the sport, entered a number of 5K races, and eventually joined her school’s cross country team. Through her work with the team, Mary has grown to realize the importance of sportsmanship and dedication. It has helped her grow not only as an athlete, but as a student and a person. Her coach says that Mary is extremely talented and driven to excellence. She will be a genuine asset to the American Running Camp and prove herself to be a leader in the program. Another deserving athlete to make Walter proud! 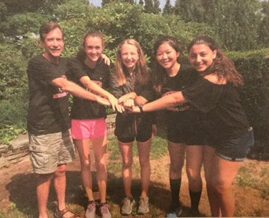 Lauren Grela (L) with friends and Steve Jones, camp counselor/medic since 1986! Lauren was a recipient of a Walter Burgess Scholarship last year and because of that truly rewarding and educational experience, she applied again this year. She has carried the five Oregon principles that she was taught (moderation, progression, adaptability, variation, and callousing) through all her workouts as she continues to become a more experienced runner. Lauren’s coach describes her as an exceptional teammate and intense competitor with a sweet personality who adds tremendous value to the team chemistry. 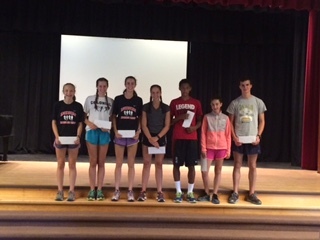 We are pleased to offer Lauren another year’s experience at the American Running Camp through this scholarship. Athena is currently a three season runner for her high school. She also competes in many 5K road races throughout the summer to loves the sport an how much it meant satisfy her passion for running and to stay in shape. In 2013-14, Athena was diagnosed with Lyme disease, After a major process of testing and treatment during which Athena was too weak to compete or even run, she learned how very much she appreciates the sport and how much a part of her life running had become. She suffered another setback in 2015 when she found out she had an inflamed growth plate in her hip. However, even though she couldn’t compete herself, she attended every school track meet in order to cheer on her teammates. With this scholarship, Athena will be able to attend the American Running Camp to get a head start on the next cross country season and to continue to grow as a runner. Another deserving recipient of the Walter Burgess Scholarship. Nasir likes to run because it calms him down and relieves his stress over family or school problems. Sometimes he thinks he could run forever. Nasir’s coach has watched him develop over the past two years from a quiet kid with a lot of natural ability into an excellent runner. Nasir’s quietness was he way of taking in all the advice of coaches and teammates. He proved to be the best at listening and learning! A runner after Walter’s heart, I am sure – an excellent choice for a Scholarship. Hannah loves to run. She has excelled on her school Track & Field team, placed 1st in her age group at the Jamestown Bridge 5K Run, participated in the Boston Marathon Youth Relay, and does many races throughout the state. Her mother is a runner too, and they enjoy running together. Hannah is involved with community service, volunteering at her church bazaar, in Earth Day activities, and donating educational toys to an orphanage in Tanzania with her family. Hannah will be able learn techniques at Camp that will help her grow and mature into to an even more accomplished runner as her young career unfolds. Hannah is another deserving Walter Scholarship recipient for this year! Latest from Hannah ~ I can not thank you enough! Hannah had an amazing time. She is loving running season and will be doing Junior Olympics next weekend. She’s on an invitational team and they’re running every day. Morgan runs every day and spends a good chunk of his free time watching races on YouTube or daydreaming about his next run. 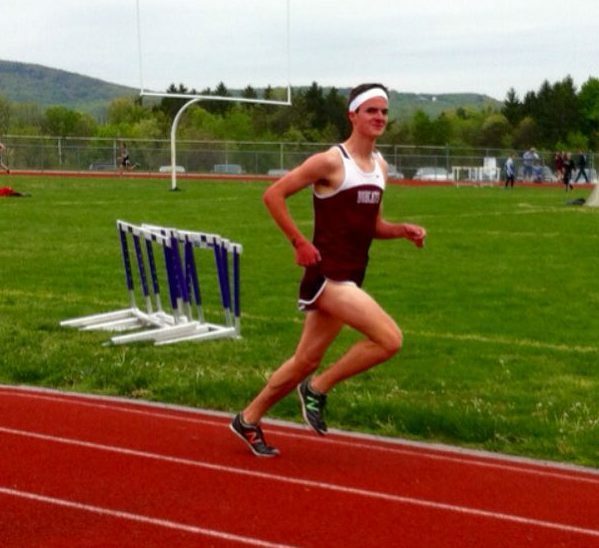 Ever since his first meet, the atmosphere of competition, the feeling of “runner’s high”, and the euphoria of the finish hooked Morgan on running. Morgan sets running goals for himself and has the drive and desire to work toward achieving this goals. He has met some of his best friends competing in track and field. Morgan is also well rounded off the track, as he is a National Honor Society Member, Nat’l Speech and Debate League Member, Vice President of his school’s Debate Team, and hours of service to Helping Hands Ministries in Harrisburg. Morgan will be a strong addition to the American Running Camp and is an ideal recipient of a Walter Scholarship. Anthony feels that running is a part of his life. He looks forward to running every day and feels that it relieves stress. Anthony is not only one of the top runners of the State Championship team, he is one of the top,runners in the state of Massachusetts. Anthony’s coach states that he has an incredible athletic ability which he matches with his willingness to do anything to improve. This scholarship will allow Anthony to improve on his already tremendous running skills and help him to become a,leader,on his high school team. Another student to make Walter proud.